Before we started I began to make plans. I found inspiration from a few things. First off, restaurant kitchens, I love how they always have floor to ceiling tile. 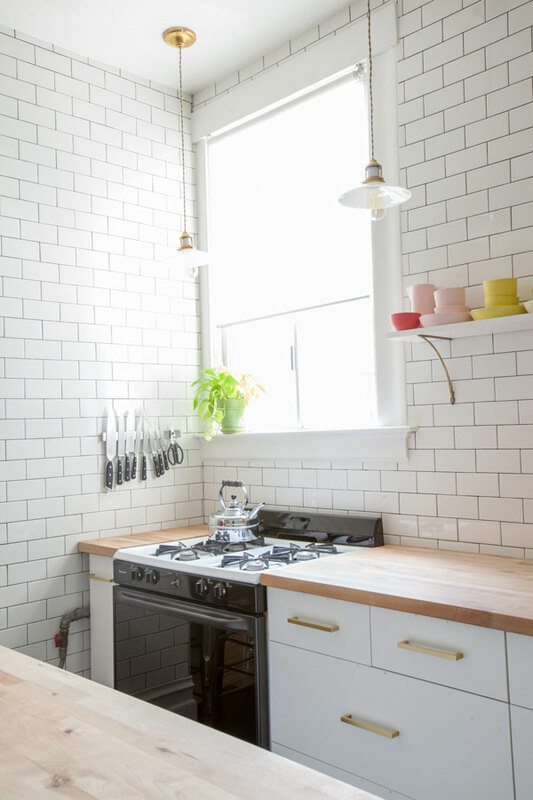 I also knew I wanted open shelving and I liked the look of white European kitchens with vintage brass faucets. Here are some pictures I’d pulled together. 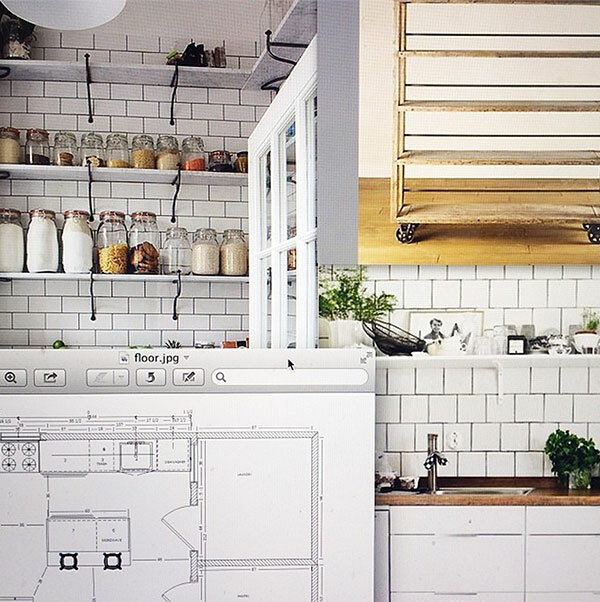 Once I had decided on a basic layout for the kitchen, I called my childhood best friend (who was a kitchen designer.) She talked through some of my decisions with me and sent me a CAD drawing of our kitchen. It was helpful to have the tips of people who knew what they were doing. I also did a bunch of research on finishes. 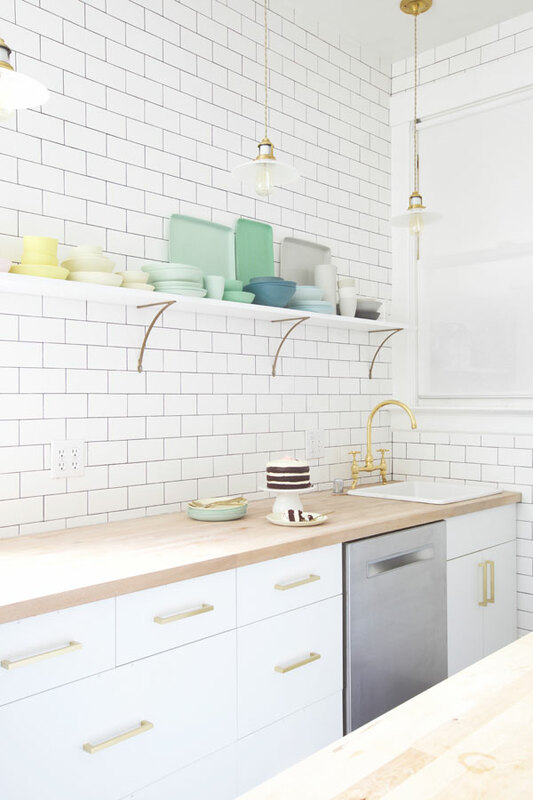 I looked for the perfect brass shelf hardware and the perfect vintage faucet and we talked about doing different countertops (at one point I was gunning hard for Carrera marble.) Eventually we decided on the ikea butcherblock because it was $300 and I decided It would be nice to live with things for a year or two before I committed to an expensive finish. I could always upgrade pretty easily to the nicer stuff later on. Once we had our plans we started to demo the entire kitchen. It was rough work and took almost four days. We hired someone to take away the old tile and waste. The walls weren’t in condition to tile and we decided to install a tall crown moulding to mimic the rest of the house. It took quite a bit of time to prepare everything and install floor boards before we were ready to tile. Flooring. We had several ideas for flooring but in the end just went with an easy overlay PVC tile from Lowe’s. It’s not my first choice but it was the simplest and it’s fine. We installed it in just a day or two and it was inexpensive. I really wanted to do radiant heating and handpainted- graphic ceramic tiles but we’ll have to save that for when I have more time and money. We built the new ikea cabinets and put them into place then attached the countertops and sink. I remember getting really frustrated at this point because I was so sick of take-out and doing dishes in the bathroom sink and living with a layer of dust on everything. When the dishwasher and sink got hooked up I remember crying I was so happy. It is funny now but it was NOT funny then. The kitchen was functional and we cleaned up all the dust but it still took a long time to get all the details finished. A friend told me that all the little things take as much time as the big stuff. Maybe we were just sick of working on it at that point but we didn’t put on hardware or install things like the kickboard on the cabinets for a month or two. We didn’t install the kitchen island until a few months later or the lighting until a year later. If I could do it again I think I would just hire a contractor but it was a good lesson and I’m glad we did it. Special thanks to my in-laws who without their help we never would’ve dared attempt it. And thanks to my friend Ashlynn Mitchell for help with kitchen design and my friend Jared Rusten who lent us power tools and gave us advice. If you’re interested in seeing the rest of our house, check out our Pantry, Bedroom, Kids’ Room, Bathroom and Dining Room makeovers. You did something great!! I love your kitchen! So fresh! 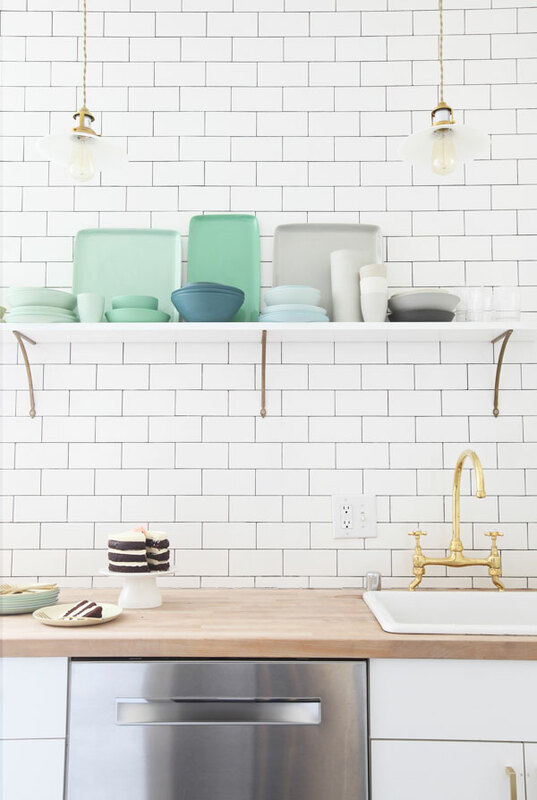 Can you share what color grout you used? I’m in the middle of a bathroom renovation and keep waffling on the grout color for the subway tile! Does it show a lot of water stains? We are in the middle of a remodel and I am planning to do the black grout and a friend commented it may show a lot of dirt. I think the grout line is so thin that it may not be a problem but just wanted to ask since you live with it every day! Soooo lovely!!!!!!! Well done!!!! We also just went through a renovation and it is the most amazing feeling. We weren’t as brave as you guys though! We hired a contractor! Wouldn’t have survived without him. Oh my gosh, this is what we are doing now!! And living in it . . .washing up in the bathroom sink! You’ve done a fantastic job on your kitchen, I love the tiling!! Looks so clean, but stylish also. Great job!! Great post! And am very impressed that you installed all those tiles yourselves! I have just bought a house in Oakland and will be remodelling the whole interior (I was an architect for 5 years so ive got the designing part down), but was toying with how much of the physical remodelling I wanted to do myself. I like the idea of putting my heart and soul into the house, but on the other hand, everyone I talk to who have done the work themselves like you say the same thing, ‘next time, im def hiring contractors!’, so I think ill just go down that path! 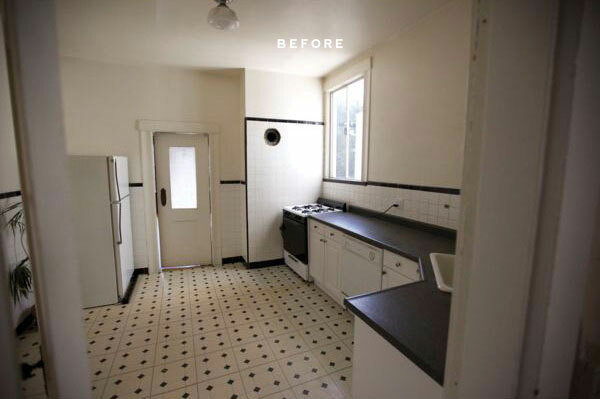 Wanting to redo a floor in my rental (probs with cheap linoleum) but I like that black tile, and also that such great style can be done on a budget). Here’s to butcher block counters! I love the look! What color white did you use for your trim work? I’d love to know what your budget was and what you ended up spending? Thanks! Looks amazing! Good question! I wish I had kept better track of this. I’m pretty sure I was trying to stay under $7,000. By the time everything was added in (including lighting and electrician and unexpected things like a plumber) I bet it was more like $14,000. It looks like it cost a lot more. Kudos! Your whole house is lovely. I like your kitchen It’s pretty and clean (in terms of design) and I’m guessing it didn’t cost ridiculous amounts of money. I feel like most people go a little crazy and spend way too much on their kitchens, only to rip it out in 10 years or so. “three weeks max,” lol! lol! lol! the brass is beautiful, but boy, i think you got the most bang for you buck with the floor. big change for the better. enjoy. Love love love this! So clean yet colorful and soft. Can I ask how you like your IKEA butcher block, and how you maintain them? We just installed them in our kitchen and I’m debating sealing them vs mineral oil. Thanks! I LOVE the floor-to-ceiling tile. Makes everything so bright and warm but kind of cool and industrial at the same time. And major props on doing it all. We painted our kitchen cabinets and nearly had a meltdown from that alone. I can’t imagine doing all of this ourselves. 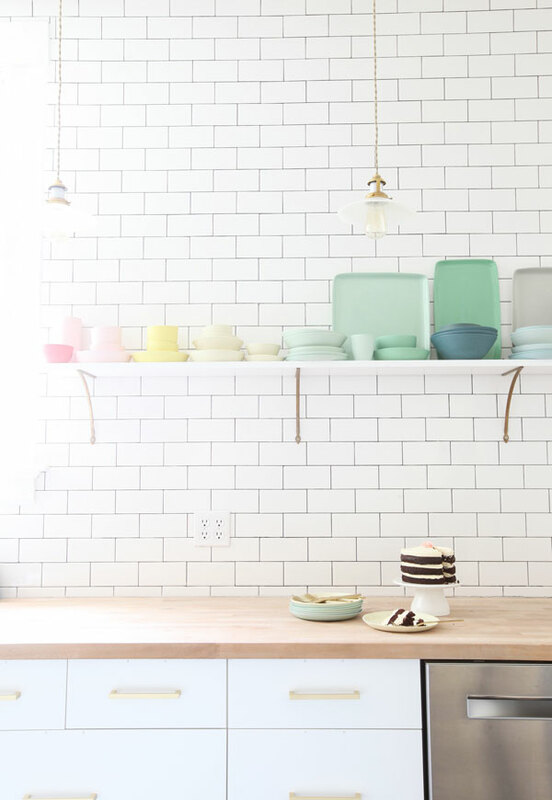 I love how you styled your open shelf with colorful dishes! Weird question, but I know that you love open shelving. Do you find that your dishes get dusty or dirty when being so exposed? It looks simply gorgeous, I’d just be afraid that if I didn’t use all my dishes enough then I’d have some built up ick to deal with. 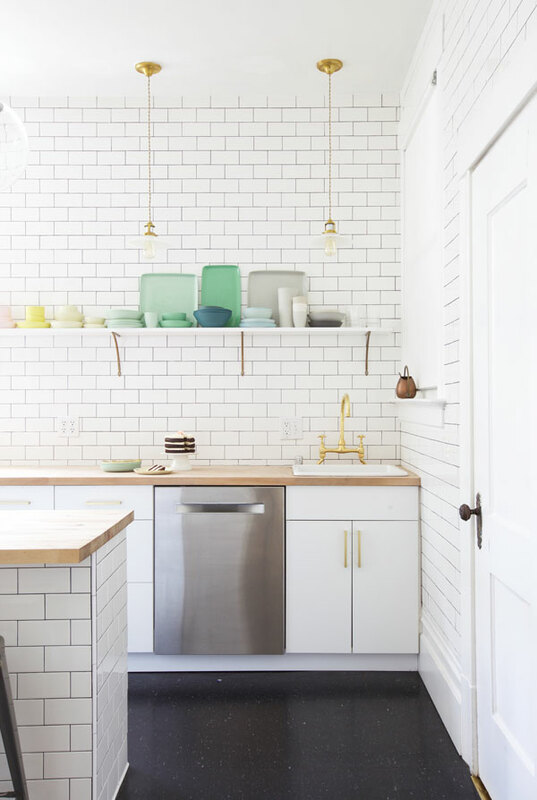 This is gorgeous; this reminds me so much of the kitchen transformation we just did in our house – ikea cabinetry and white subway tiles, I love it! I’m drawn to the minimalist aesthetic. 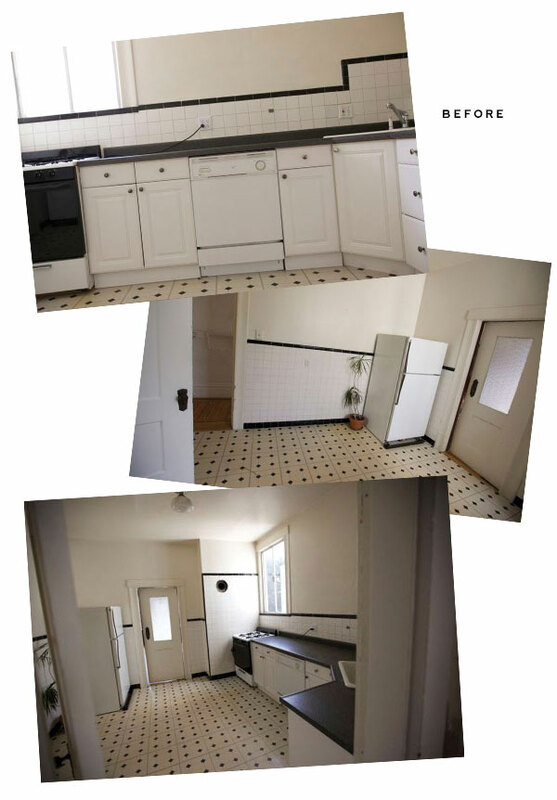 I like your kitchen, but a couple of questions. The sink in the corner with no window… it seems a little cramped.. . Actually, perhaps that is a window to the right? It look painted. Also, is it very noisy with floor to ceiling tile? 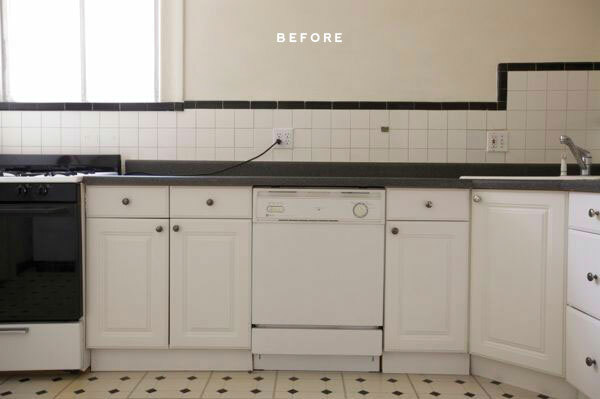 Do you have a photo of the kitchen “after” like the before one where you’re looking from one end to the other? That would be great. (the sink end down to the refrigerator end? Your kitchen is beautiful! All that tile looks so gorgeous! Definitely my favorite part! 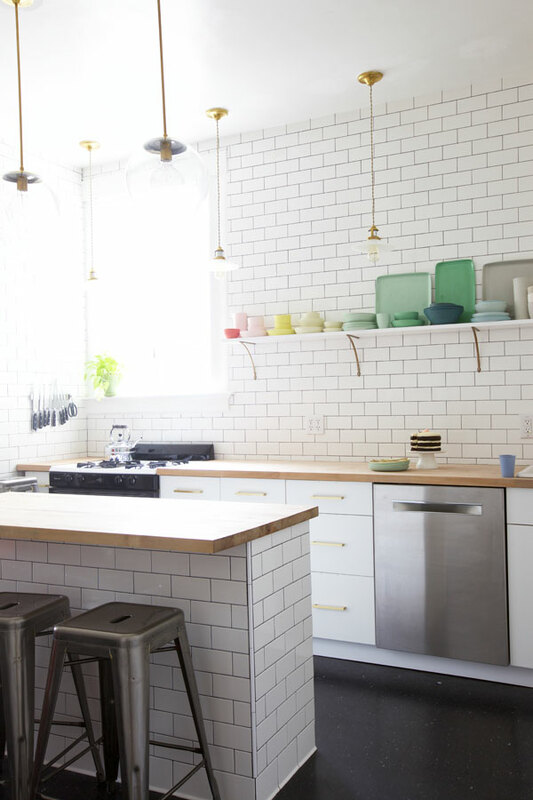 Living through a renovation you definitely appreciate the finished project more in the end. 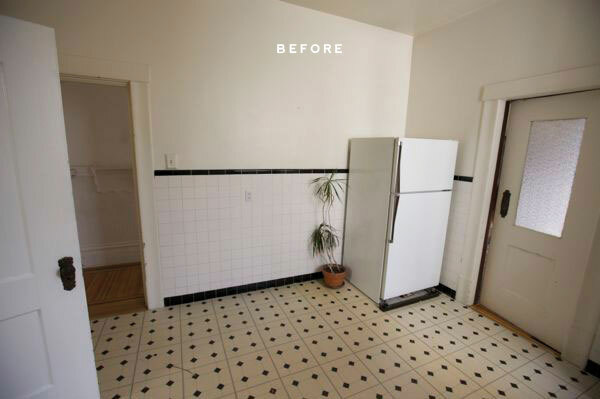 You’re so lucky to have such a big kitchen in a San Francisco apartment! The transformation is stunning. You should be very proud of your hard work. Thank you for sharing your experiences and sources – that is so generous. 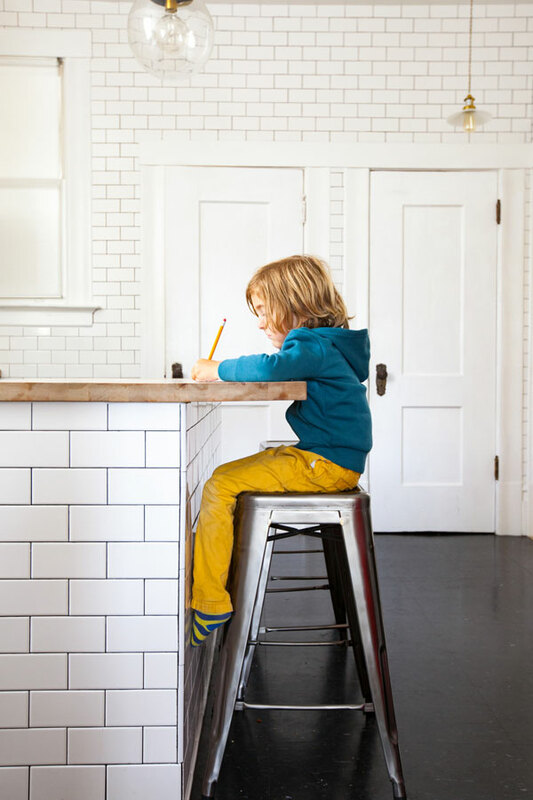 We are mulling on the Ikea butcher block and this has been a very helpful post. Jordan, I love your interiors work – I would read this blog for these posts alone. Would you consider doing more posts along the line of your Weekend Refresh makeover? Great work. Wha?! 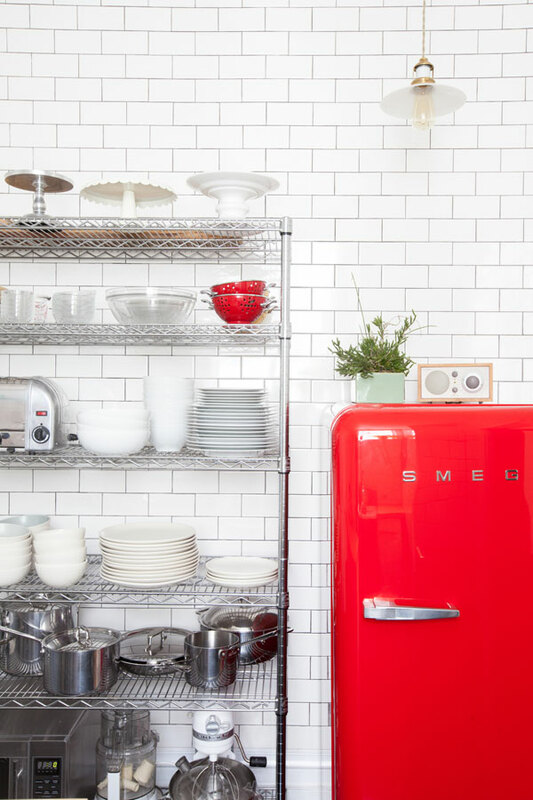 I am still stuck on the smeg for $300! Obviously we need to come smeg hunting near you. Beautiful job, I too have a thing for restaurant kitchens…went to a restaurant supply and bought our sink…now I just need to sew it a skirt! 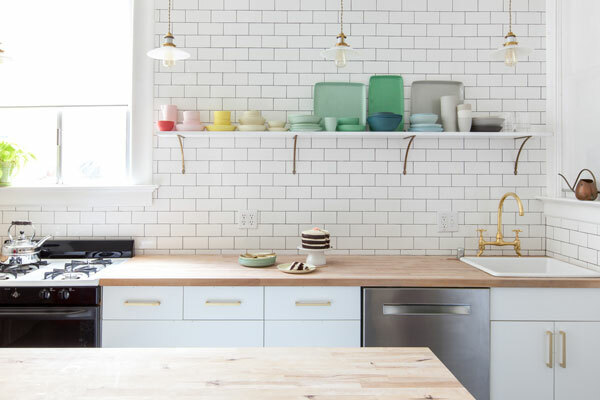 Love the clean lines & rainbow dishes. So cool Jordan, way happy for you guys! WOW! i wish i saw this post before i had my kitchen remodeled! this is absolutely gorgeous!